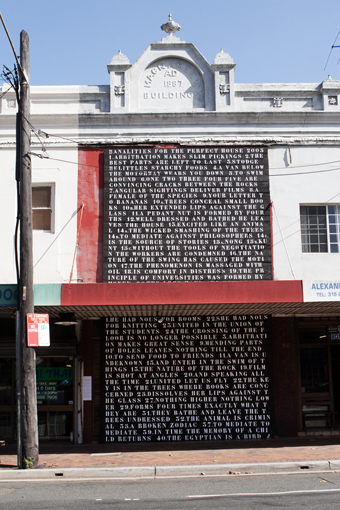 Whether referring to the artist’s signature agit-prop banners, collaborative illuminated Indigenous oral history installation, people’s poems or public art commissions, this expansion of Lewis’s practice into the civic realm is also a prominent feature of the artist’s first major mid-career survey. At Hazelhurst Regional Gallery in Sydney’s south, itself a uniquely modelled complex designed to maximise community engagement, Lewis is activating and inhabiting the space in ways that spill out beyond the architectural confines of the gallery’s white walls. 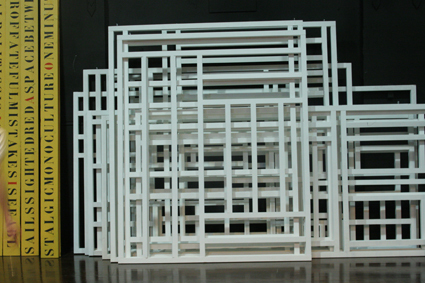 “I want to compose a certain formality within the gallery space itself,” Lewis explains. “Whereas I need a particular informality outside in the garden, interactive works that move and shift around, that kids can play with and audio in the garden as well as a people’s poem attached to the cottage.” Built in 1947 and later bequeathed to the local community (along with the surrounding 1.4 hectare estate), the Hazelhurst cottage is an early example of an architecturally designed house in the Sutherland Shire and certainly a resonant site for reprising Lewis’s striking black-and-white textual skin of aphoristic statements, Banalities for the Perfect House (2007). For audiences, the survey provides a rare opportunity to view a significant body of Lewis’s work in one space alongside newer pieces. These works continue to reflect the artist’s talent for devising idiosyncratic methods of translating longstanding concerns in unconventional, and often deeply personal, ways. An earlier engagement with the paintings of the Yirrkala region which led to a memorialising suite of transcription drawings, for example, has assumed a new direction since Lewis met Yolngu artist Barayuwa Mununggurr in Sydney. 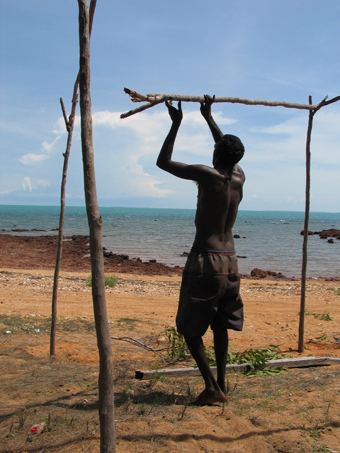 In 2009, the pair commenced a creative exchange which has seen Lewis twice make the long journey to Mununggurr’s ancestral country on the east coast of Arnhem Land. During a visit to Yarrinya, at a saltwater location at Blue Mud Bay, Lewis became immersed in subjects related to Mununggurr’s paintings. For the survey exhibition, Lewis presents a set of newly constructed mobile shelters, functional yet ultimately sculptural works that visitors can test out for themselves in the Hazelhurst gardens. These nomadic architectural installations, titled Star Shelters (2012), stem both from Lewis’s concern for the thermal exposure crisis experienced by Sydney’s homeless people during wintertime and his desire to create a temporary housing solution for the Darwin homeless, the so-called “long-grassers,” Indigenous individuals and families who visit the city without a place to stay and who sleep rough outdoors. Lewis observed the long-grassers over a nine-week hospital stay in Darwin earlier this year. It was during his hospitalisation that he began the prismatic black-and-white graphite drawings, made to chance formulae but also responding to ideas of Aboriginal astronomy, which have since evolved into the shelter works. If the chronological and classificatory logic of a survey reveals a tendency to freeze works as finite objects in space and time, Lewis is resisting this impulse toward stasis by using documentation to “bring into the audience’s perception that there’s also a lot of performance that goes on around the works.” Two live works in the gallery with dancers and choreographers Tess De Quincey and Alan Schacher are programmed, the latter involving Schacher’s response to Lewis speaking the 1943 version of the aphoristic text, Directions, by the largely forgotten Sydney poet of the PUSH movement, Harry Hooton. It’s this summoning spirit which similarly permeates so much of the art of Ruark Lewis. Recovering and illuminating the nuances of place, history and community without losing their critical force, Lewis skillfully translates enough of the strangeness in these manifold stories to keep their poetry alive.